Cosmos is a hardy, erect annual requiring very little moisture once established. A native of Mexico, it can easily adapt to all regions of the United States. The attractive flowers are a mixture of stunning deep crimson, soft pink and pure white. They bloom summer through fall—how can you beat that! The delicate looking leaves are deeply dissected, almost threadlike in appearance. Plant in full sun and give moderate water. Cosmos is beautiful planted en masse or spread irregularly throughout a perennial bed. This annual can self-seed, so if you plant this year, you’ll definitely have seedlings next year too. 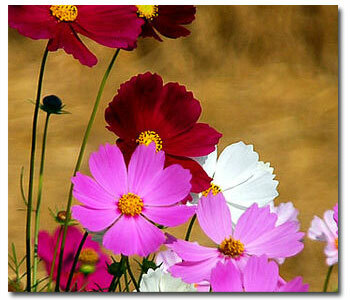 Although cosmos will grow in poor soil, it is important that the soil drains well, as they don’t like soggy soil. Stake your tall cosmos to keep the flowers standing upright. When blooms are spent, deadhead or pinch them off to encourage more blooms. Deadheading will keep the plant from growing out of control. If you do want the plant to reseed itself, don’t remove all the blooms; leave some on the stem.